On November 10, 1957, the world of sports car racing forever changed as the checkered flag waved on the first race at the all-new Laguna Seca Raceway. Now, 60 years later, Mazda Raceway Laguna Seca continues to thrive. To commemorate the special anniversary, the track’s heritage will be celebrated at the Rolex Monterey Motorsports Reunion Aug. 17-20 and exemplified by this year’s exquisite poster. 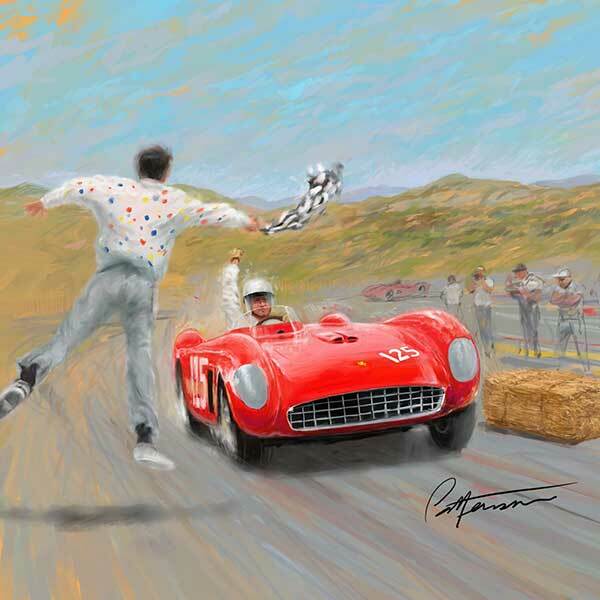 Today, the Sports Car Racing Association of the Monterey Peninsula (SCRAMP), the management company that built and continues to operate the County of Monterey-owned facility, unveiled the Rolex Monterey Motorsports Reunion poster art by Bill Patterson that features the inaugural win by Pete Lovely in his Ferrari 500 Testa Rossa. Lining up on the starting grid in third position behind Carroll Shelby in a Maserati 300S and John von Neumann in a Ferrari 625 TRC, Lovely’s rather underpowered 500 TR wasn’t expected to give a the more powerful cars a run. But Lovely drove a masterful race and passed von Neumann in Turn 9 on the last lap to edge out victory and take the checkered flag from the polka dotted shirt flagger. The art will be available in limited-edition 24×36-inch posters that will be sold exclusively in the Mazda Raceway Laguna Seca Souvenir Store beginning Aug. 11. Bill Patterson will also be present throughout the weekend of Aug. 17-20 to meet with guests and conduct poster autograph sessions.